The Marx Brothers had a set formula, where everyone else played the drama straight and they did whatever they wanted. So essentially there is no formula, lending itself to the anarchic comedy that they will be forever known for. However, if you put A Night at the Opera up against there earlier work at Paramount (this was their first film with MGM), you can see some important changes. Wunderkind Irving Thalberg wanted to give their films a more concrete plot line and in an effort to make them more sympathetic figures, all their antics were aimed at obvious “villains,” while they helped those who needed help. In this case, it was the aspiring opera star Rosa (Kitty Carlisle) and her beau Ricardo (Allan Jones), who get a helping hand from the boys. 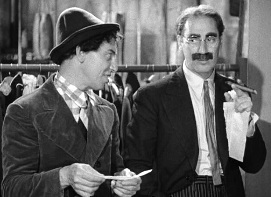 This restructuring worked out because although the film plays out dramatically under the direction of Sam Wood, the Marx Brothers are still up to their old tricks, pulling off the same stunts that they used to. In fact, A Night at the Opera would be a very boring operatic drama by itself. Some of the interludes including song and dance are rather dull even in their extravagance. But Chico, Harpo, and Groucho inject the film with their brand of comedy that is difficult to top. Groucho’s quips are aimed once more at the oft-abused Margaret Dumont. And then Harpo and Chico help befuddle the conceited opera star Lasparri, an Opera Company magnate (Sig Ruman), and the police among others. The film borrows the stowaway storyline from Monkey Business (1931) so the brothers and their friend Ricardo can follow the opera to New York. This lends itself to the now iconic stateroom scene where a total of 15 individuals are crammed together into Groucho’s tiny ocean liner abode. Earlier on Chico and Groucho have fun drawing up and ripping apart a contract for their new partnership (including the famed Sanity Clause at the end). 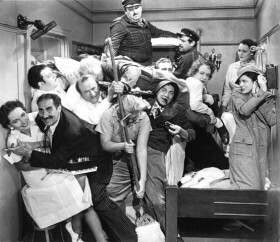 It ends up that the three fugitives are on the run from the authorities and Groucho is thrown out of his job finally. But everything culminates at the opening performance at the opera and the Brothers are in high form. Chico and Harpo invade the orchestra pit, insert “Take Me Out the Ballgame” into the arrangement, and join the cast as a pair of gypsies. Meanwhile, Groucho delivers his usual quips from the box above, much to the dismay of all the patrons. To top it off, Harpo goes swinging up above the performance making a shambles of Lasparri’s big night, and Rosa and Ricardo are able to win over the audience. But it goes without saying, it’s the Marx Brother’s who steal the show. Groucho is as rude as ever. Harpo is always ready to knock someone out, and Chico is just waiting to join in on the ruckus. It’s comic mayhem at its apex. This entry was posted in 1930s, Comedy, Musical and tagged Great Film, Margaret Dumont, Marx Brothers, Review by 4StarFilmFan. Bookmark the permalink.